Titanium and carbon frames are the best frames you can buy as they are light weight, but Titanium is stronger. Titanium mountain bike frames are at the high end of the market, but if you can afford one…why not? Especially if they are on sales like the ones we have found below. 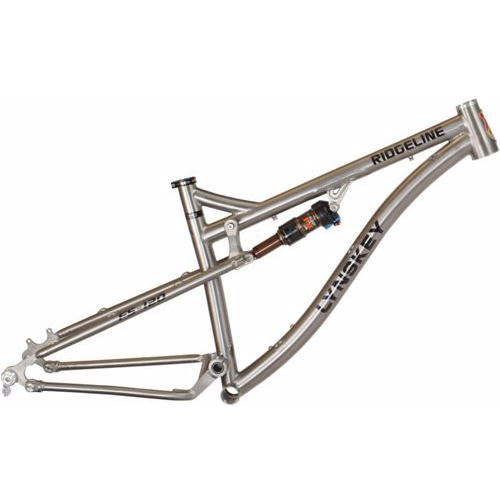 Creating a mountain bike frame from titanium is extremely difficult, the entire process from sourcing the material, molding, welding and finishing is more expensive. How heavy are titanium frames? All frames will differ in weight but they are generally lighter than Steel, but will likely be heavier than an aluminum frame. Titanium frames are generally also heavier than carbon frames but have a higher density. Titanium MTB frames are more resistant to the impacts of tough riding, they actually absorb the shocks. Titanium frames are more expensive than carbon, but if you are doing trail riding opposed to road then titanium is for you. Relative to aluminum frames, yes. But if you are building a high-end custom bike it is worth biting the bullet. Note – the frames we have highlighted below are all currently on sale with big discounts. There are two main titanium frame producers in the mountain bike niche, Lynskey Performance and Kona. You cannot buy direct, but have to go through one of their distributors (see below). Linkskey Performace built their first titanium bike back in 1986, so they have a lot of experience. Below are 5 Titanium frames for you to choose from and prices. 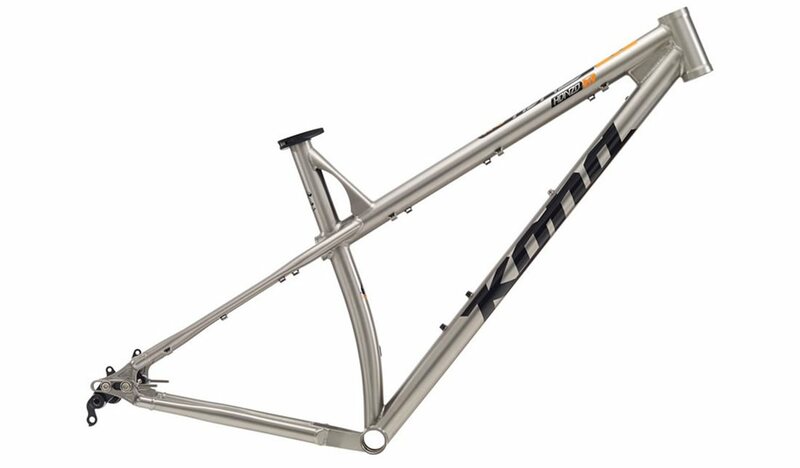 Built by Kona to withstand tough terrains, this MTB frame is beautiful. The frame is optimized for 29ers but is still fine with 27.5″ wheels. The frame will require 120-140 mm folks and is designed to have a dropper post. Kona started out in 1989 and built a strong reputation in the industry, they also run have their own MTB racing team. This Kona titanium frame is a 2015, but the frame style and look is still cutting edge for 2018. 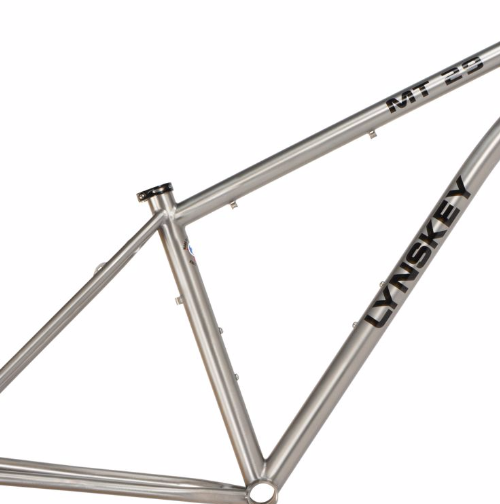 This frame is actually manufactured by Lynskey Performance and supplied to Kona for the branding to be added. The frame is designed for 27.5 wheels and has a 3-2.5 seamless tube. 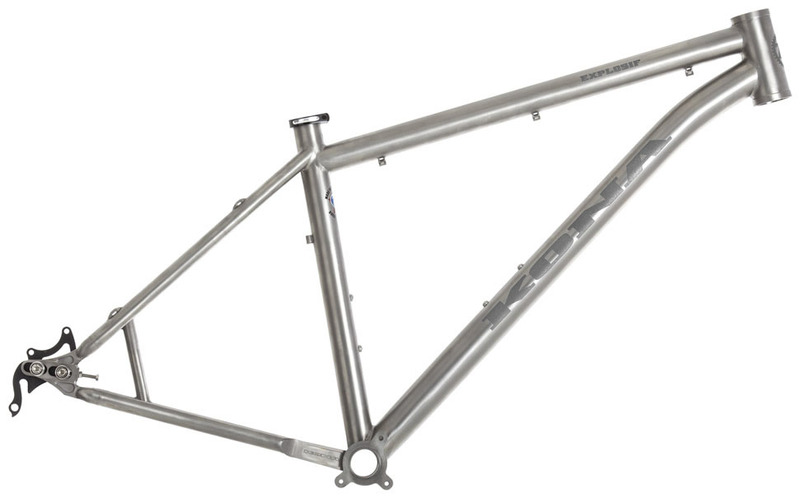 This Titanium frame from Lynskey Performance was designed for tough terrains. The frame technology is insane, the titanium used is certified aerospace grade! The frame is designed for a 29″ wheel and has a 44mm oversized tube head. At the higher end of the price scale, this titanium frame is full suspension. The suspension is the Fox float DPS which is pro standard. 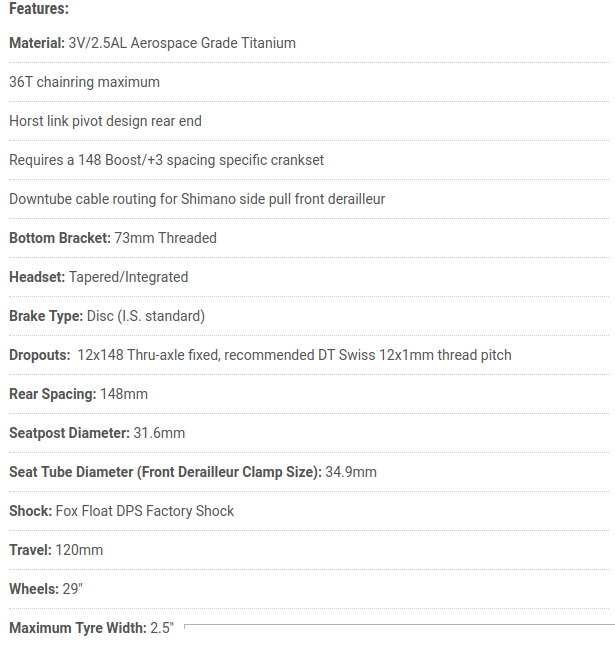 Designed for MTBRs who want to custom build a full suspension 29er and only want the best.